Object: Hold'Em Poker is the most popular form of poker in the world today. 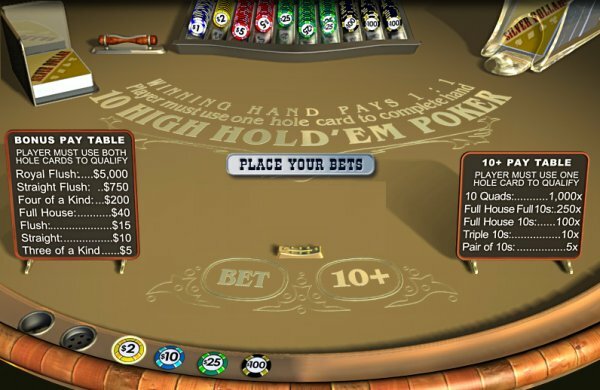 This version of Hold'Em poker has Bonus payouts based on the 10 card. That is why it's called 10 High Hold'Em poker. This game is played using a 52-card deck with Jokers removed. You compete against the dealer. After cards are dealt in Hold'Em fashion, the house creates the best 5-card poker hand for you and the dealer from a selection of 7 cards. Your hand is compared with the dealer's hand. If your hand has a higher value than that of the dealer, you win. If the hand values are the same, it's a tie and your Bet is returned back to you. Payouts for Bonus and 10+ bets are based on their respective pay tables and are independent of the main game result. Royal Flush 5 suited cards in sequence, topped with the ace. For example, a Royal Flush in Spades. Straight Flush 5 suited cards in sequence. For example, an Eight-high Straight Flush in Diamonds. Four of a kind 4 cards of the same rank. For example, four Queens. Full house 3 cards of the same rank, plus 2 cards of the same rank. For example, a full house with 3 aces and 2 fives is a Full House, Aces full of Fives. Flush 5 cards of the same suit, not all of which are in sequence. For example, a King-high Diamond Flush. Straight 5 cards in sequence, not all of which are the same suit. For example, a Ten-high Straight. Three of a kind 3 cards of the same rank. For example, three Queens. Two pair 2 different occurrences of 2 cards of the same rank. For example, Two Pair -- Jacks and Nines. One Pair 2 cards of the same rank. For example, a pair of Queens. High Card Cards all of which are different ranks and are not all the same suit. For example, Ace High. Two cards are dealt face-down to both player and the dealer. These face-down cards are also referred to as "Hole cards". Dealer discards the top card from the deck of cards. This card is called a "Burn card". Dealer deals the next 3 cards, face-up on the table. This is called a "Flop". Dealer burns another cards and deals one more card onto the table. This is called a "Turn card". Dealer burns the final card and deals one last card onto the table. This is called a "River". The five cards that are dealt face-up are called "Community cards" that the player or dealer can use to form a five-card poker hand in combination with their hole cards. All 3 Burn cards will stay face down on the left hand side of Community cards. Initial Bet: Players hand is formed by using his/ her hole cards in combination with the community cards. At least one of the Player's hole card must be used to form a winning combination. 10+ Bet: At least one of the player's Hole card must be used to form a winning 10+ bonus hand based on the 10+ Paytable. One of player's card must also be a 10. Bonus Bet: Both Hole cards should be used to form a winning Bonus Bet hand based on the Bonus bet paytable. The dealer's hole cards are exposed after the player's poker hand is selected. Once the dealer's hand is exposed, your hand is compared to the dealer's hand and win(s) , loss(es) or tie(s) are determined and payouts are made. Online Play: There are a few sites that offer 10 High Hold'Em Poker. You can try 10 High Hold'Em Poker risk-free at any of these casino by utilizing the Practice Mode. If you decide to play for real, then be sure to pick a site that offers at least a 100% first deposit bonus.